28/5/10 – Heritage – Le Vésinet, church – In July 2009, the Sacred Heart chapel in the church of Sainte Marguerite at Le Vésinet, painted by Maurice Denis, was severely damaged by a fire (ill. 1 ; see news item of 18/8/09). 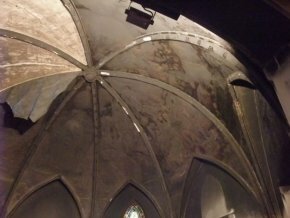 At the time, it seemed that the marouflé canvas on the ceiling would be permanently lost : the December 2009 report states in its opening remarks that “the extent of the damages […] seemed to be insurmountable at first”. Quite fortunately, this study now shows that much of the pictorial layer resisted better than expected. Emergency conservation measures and cleaning tests have just been completed with impressive results. The painting, barely discernible, is for the most part still well preserved under the layer of soot (ill. 2, 3, 4 and 5). Strangely, some repainting from an awkward restoration done in the 1980’s helped to protect the original. As we had said, almost one entire strip burned (ill. 6). Another, which hung from the ceiling, has been taken down and will be restored before being put back. A scientific committee has been appointed and will decide how the restoration is to proceed. While a large part of the décor can be recovered, there are several options available. For example, how to replace the missing part ? There are various solutions : not do anything and leave the stone bare or paint it in a neutral colour, evoke the composition with graphics, a drawing with general outlines, or offer a painted copy. The second would seem to be the most sensible, rather than presenting a fake which would make the ensemble confusing to look at. However, the stained glass which was lost will be replaced with an identical piece, not in any way problematic. Surprisingly, the fire revealed another stained glass window which was thought to have disappeared. It was located above the painting representing The Crucifixion, but the wall was covered over at this spot (ill. 7) and everyone thought it had been lost or had never existed. During the studies carried out for the restoration, the stained glass was discovered behind the masonry, visible from the outside but only by climbing onto the roof and looking at it close up. The cartoon is held at the Musée Maurice Denis in Saint-Germain-en-Laye (ill. 8). Another find after the fire : the flower garlands seen in the matching chapel (ill. 9), also painted by Maurice Denis and no longer visible are well preserved and can be uncovered. In the same way, the niche, holding a sculpture of Saint Joseph, walled in but visible from the outside, will be opened. The stained glass window in still underside. We would like to point out that government authorities, both the Ministry of Culture and the town of Le Vésinet, reacted very quickly to the fire. Just barely a month later, Frédéric Mitterand who was in the Yvelines department, went to the site to look at the damages and stated that the ministry would take its part in the restoration. Although much of the funding will come from insurance since it was an accident, negotiating this type of settlement usually takes a long time and it was urgent that action be taken before. The city has thus taken on all of the costs, allowing for scaffoldings to go up and studies, along with preliminary work, to get started (ill. 10). Let us now hope that everyone will do his best to see the project through till the end. This means not only the restoration of the chapel but also all of the painted décor in the ambulatory, entirely produced by Maurice Denis.